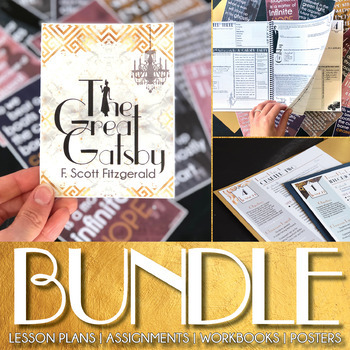 Daily detailed lesson plans, unit overview, student workbooks, printable materials, engaging posters: all you need for teaching Fitzgerald's The Great Gatsby. This iconic novel is taught year after year in classrooms around the world, and for good reason! You may be teaching this text for the first time, or looking for new resources to reinvigorate your teaching, having taught it for many years; either way, these The Great Gatsby resources are for you! 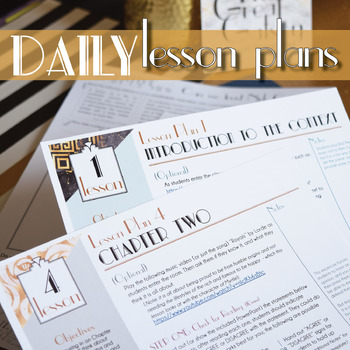 Lesson Plan Pack: Over 18 detailed, engaging lesson plans for teaching The Great Gatsby; a complete unit with pacing guide, daily lesson plans, worksheets, slideshows, and more! This complete bundle will guide you through the process of teaching the novel from start from finish. 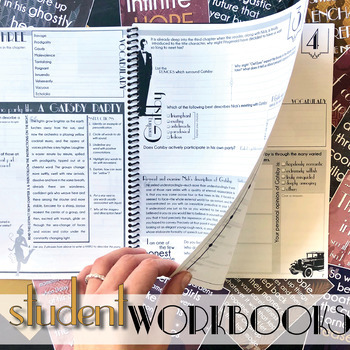 The Great Gatsby Student Workbooks: Are you bored of teaching the novel by just reading and setting questions? If so, these workbooks are for you! 40 pages of out-of-the-box activities for students to work through. From analyzing plot structure to writing Twitter statuses for the characters, these pages are packed with thought-proving and engaging exercises for the novel. 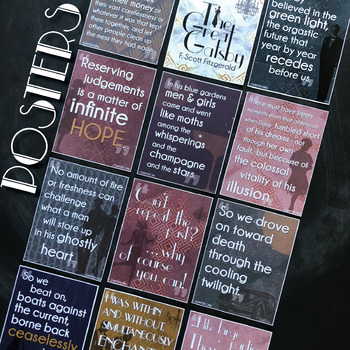 Posters: A set of classroom posters with quotations from The Great Gatsby. A great way to visually reinforce key lines from the text, and to brighten up your classroom walls. The Great Gatsby Assignments: 5 Engaging assignments for students to complete while studying, or post-reading! From creating original cover artwork, to a final unit quiz, these will help students demonstrate their understanding. Looking for other resources for teaching literature?